Gosh, I have not done a 60s Band of the Week post in months. You know, when I first started the Music Court back in 2009, my intention was to create an epic music amalgamation. Quite simply, I wanted to highlight newer bands I enjoyed with the perennial sound of the 1960s/early 1970s – the music that made me fall in love with … music! I do not want to lose the latter goal. Thus, my New Years Resolution for the Music Court is to go back to my original intention. While new music, incipient artist profiles, concert reviews, and other keen posts from Music Court writers will crowd the pages of the Music Court as always, I am bringing back the 60s/70s and continuing with the epic band profile list. Amazing Blondel kicks off the year! Sinfonia is the Italian word for symphony. Two roots in this word. Sym meaning “with” and phon meaning “sound”. It’s a Latin word (symphonia) derived from greek (both usages were for instruments). This mini English lesson does have a purpose; I promise. The consonance associated with sinfonia is ancient. Sweet sounds have always engendered pulchritude and comfort. This was no different in the in the 60s/70s. Available among the genre smorgasbord was a sub-genre of the folk revival called folk baroque. Known musicians like Simon and Garfunkel (“Scarborough Fair”) and Nick Drake explored this genre, which blended English antiquity with modern American sounds. This was just one example of progressive folk/pop. The Incredible String Band took this genre to new levels with the release of its exceptional album The 5000 Spirits or the Layers of the Onion. This album implemented medieval instrumentation (oud, flute) and African instrumentation – we can thank the perspicacious Robin Williamson for this. Thus Medieval folk rock was born. 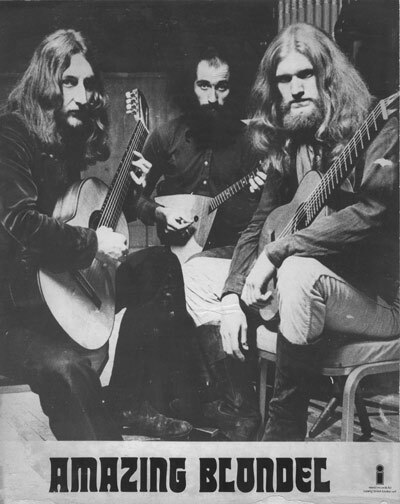 Two of the most popular bands from this genre were Pentangle and Amazing Blondel. Amazing Blondel was unique, though. Many bands in the Medieval folk rock genre embraced jazz and electric music influences. Amazing Blondel stayed true to antiquated instrumentation (lute, theorbo, cittern, tabor, ocarina, flute, crumhorn, dulcimer, and glockenspiel). For the flute, they were compared with Jethro Tull, but Amazing Blondel was in a musical class of its own with a multifaceted genre that no one could quite pin down. It was medieval-style music with British performers. I’m just impressed the band was able to find the instruments I listed above. One would think there were (and are now) not many music shops selling crumhorns. Amazing Blondel was started by John Gladwin and Terry Wincott, two multi-instrumentalists who left harder rock music to form a band that focused more on delicate instrumentation and wispy singing. The band focused on acoustic instrumentation and clearly pulled from a good amount of resources. The band added Eddie Baird after the release of its debut self-titled album in 1970 and started touring with bands like Procul Harum and Genesis (makes sense, right?) The full band released three albums from 1970-1972 and a few more after John Gladwin left. Of the band’s albums, the 1972 release England is my favorite of the band. Why don’t we have a listen? The strings in this track are mesmerizing. The listener is caught in the instrumental story. The song shifts from a depressed darkness to light fast-paced strings and then back to staccato rhythms over a glum harmonium (may be a mellotron). I was always struck by the proficiency of the musicians. It’s a remarkable little piece and my clear favorite on the album. “Landscape” is your classic upbeat medieval piece fit with lovely flute, background strings, and mellotron. The vocals are fine and feathery like a soft pillow. It is also just so British, which works so well for all of Amazing Blondel’s music. It is difficult to dislike this song. It’s just beautiful, plain and simple. ← What Do “You Say” About Morning Fuzz?